experience architect weblog: Comfort Spaces and CX: Lessons from the Bathroom Blogfest. Comfort Spaces and CX: Lessons from the Bathroom Blogfest. After reading my humor-driven posts on Bathroom Usability and Cottonelle on Crack, friends Becky Carroll and CBWhittemore asked me to participate in the “bathroom blogfest.” This year’s theme is “Mad Men: Bathrooms of the 1960’s”. You can read all it here, and access the Blogfests 30+ participants, as well! 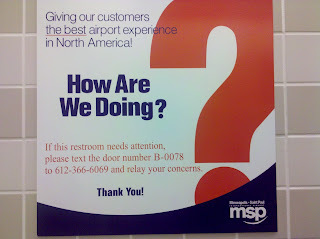 In short, it’s all about bathrooms and customer experience. The architects and designers of the 1960’s knew how to use space, color and texture to create comfortable, luxurious spaces for relaxation and conversation. They used form, shape, color, pattern, texture and rich materials to create depth and warmth. They accessorized with over the top details and accessories. These trends are clearly seen in the bathrooms of that era – bathrooms that became more than just functional – but in escape from the frenzy of a pressure-filled decade. From chandeliers to mirrors, wood paneling to textural wall paper, granite to marble, luxury abounds in the bathrooms of the 60’s. Space was used creatively to establish zones for personal care, pampering and relaxation. Lounge seating was often installed. Traditional vanities and credenzas became more “furniture like.” Fixtures like chandeliers add a touch of glamour. Floor coverings like carpet and flokati rugs were brought in warm, luxurious comfort. Perhaps this extra attention to luxury and comfort are why the bathrooms of the Mad Men Era were commonly called “Lounges.” Perhaps these reflect the needs of an unsettled generation, looking escape the realities of a pressure filled decade if only for a minute. At home, and in public places, restrooms became luxurious personal “comfort spaces” where people felt at ease, secure and free to relax and even converse. These rooms were less focused on the perfunctory and became more about the emotional and physical needs of the people that used them. I think this is where there's a take away lesson for all of us managing Customer Experience today. We live again, in an era of distress and turmoil. We also live in an age where we are bombarded by stimulus. We cannot count the messages we have to process, the things we have to do, learn, know and understand. We are overwhelmed by information, stimulus and the pressure to make decisions, and we must do so quickly as we attempt to manage the onslaught. As a result, the brands that make us feel even more overwhelmed, pressured, “sold” and pushed are more at risk of earning our ire, rather than our affinity. Starbucks is perhaps the king of the Comfort Space, as a huge public proponent of the “Third Place” theory creates comfort zones online, too. “My Starbucks Idea” lets customers share ideas and desires in a way that helps them impact the business. It has resulted in many new product ideas and has measurably changed the way Starbucks listens and responds to customers. The Choppe Shoppe and other men’s grooming lounges make male grooming and pampering a macho thing. Smiling stylists in chic wear hand patrons a beer while football broadcasts on the big screen, and copies of GQ and Car and Driver grace the chrome coffee table. Suddenly, "manscaping" isn’t so scary. Home Depot and Lowe's both offer classes to help customers complete “do-it-yourself” projects without totally screwing up. These classes drive loyalty and can result in increased product sales. Best Buy’s Twelpforce helps people of all walks of life make decisions about new technology purchases with a no-pressure sales approach. This comfort zone is driving sales and reinforcing Best Buy’s thought leadership. Tirerack.com (while not the best site from a usability perspective) offers several configuration applications that help users select everything from replacement tires and wiper blades to new wheels and preview the items on a schematic of their own car. It makes purchasing really easy. Caribou Coffee – My husband and I often take our 3 year old to Caribou in the morning. We can enjoy a coffee and catch the news on our Droids while our little one munches on breakfast and plays with high quality educational toys in the play area near the fireplace. They offer leather lounge seating and even a quiet meeting space that can be used as needed, or reserved in advance by work shifters (like me) and other groups. … and when Comfort Spaces are designed effectively, they are very useful in merging your brand with the lifestyles, rituals and habits of your target audience. Comfort spaces can enhance and support the customer experience at key points in the adoption continuum. And of course, they can also be instrumental in driving positive business outcomes. So, using thatbrooms of the 1960's as a muse -- name your favorite brand-driven comfort space. What does it do for you -- and how does it motivate you to do what's good for the brand? Are there any aspects of it that don't work? (E.g. the equivilant of the "flokati rug" in the space)? Leigh, you are amazing and obviously put your intense few days in NJ to good use. What a thought-provoking post. I love how you have taken us from design considerations to modern day comfort spaces. My favorites are Starbucks and Panera's for consistency and keeping the world at bay. They truly comfort me. Comfort spaces - be they analog or digital - differentiate experiences. They create a cocoon of goodwill for end users toward brands. Thank you so much for being part of Bathroom Blogfest 2010! Pretty fascinating what 40-50 years will do for you in where to get things accomplished and in what setting we are able to find comfort. Blog Action Day - What Are You Thirsty For?